What an amazing weekend!! I think I can speak for everyone who came to the Victorian Worlds Biggest Play Day and say that we all had SOOO MUCH FUN!! There was some amazing costumes for our theme Pyjama Party as our weekend kicked off with a parade in our PJ's! Congratulations to Michelle Watson and her horse Blue for taking home the prize of Best Dressed with Adele Marshall and her horse Jay coming second. Well done ladies, you both looked fabulous as did everyone else, it would have been tough to judge. Once the judging was done, everyone was busting to get out onto the obstacle course and test out their skills and take advantage of some extra confidence building with their horses. With bridges that moved, tin cans & water to walk through and many obstacles to navigate our Saturday afternoon soon disappeared and after a sprinkle of rain overnight, we enjoyed much cooler weather for a nice trail ride down to the Murray River and back again on Sunday morning to finish off with a lovely bacon and egg breakfast! A huge Thankyou goes to Sharon and Greg Johns for providing such a fantastic venue for us at Bandendella Retreat. You made us feel so very welcome and it is such a relaxing and peaceful place to camp. I recommend it to anyone with or without a horse who is looking for a place to 'get away from it all' Thanks also to Sharon for judging our Pyjama Party Costumes and taking us out for a Trail Ride on Sunday. Many thanks to the Mallee Riders Practise Group and particularly our Group Organiser, Danielle McCarthy for doing a fabulous job of putting this weekend together for all of us to enjoy AND for all the lovely food! Of course it wouldn't be an event without all the people and horses and I would like to thank everyone who both locally as well as from as far as Horsham, Geelong and Winchelsea for joining us to celebrate Quantum Savvy's Worlds Biggest Play Day 2019. Already I am looking forward to next years event where we will be all meeting at Geelong! Hi Deb, It sounds like you are doing all you can to help her - your chiro should be able to address if it is to do with birth trauma so maybe just wait till your appointment before you saddle up again. You will then have to show her that she is ok as she will be expecting it to feel the same so be ready to yield her laterally when you do your saddling procedure just like you did with Ruby. I don't think it is about pushing them through pain and telling them to put up with it. If it is physical, you need to address it and for a young horse, the first few times you saddle them, they will of course be nervous so if you teach them to soften and relax rather than stiffen and get scared you will set a habit that will help both of you out. If you miss this and they get scared then they will follow another set of habits, which we can change but the memories will still be there - I have exactly the same with Diago he was really bad for bucking when saddled when I first got him. Please join me in congratulating Deb Baumgartner from Geelong Victoria and her horse Ruby for completing their Level 1 Assignments!! This is Debs second horse through level 1 - enjoy your journey in Level 2 Deb! Hi Lunea, Some fab advise from everyone. I can only ad that if you cant get him to step sideways (it might be easier for him when you take the divider out) try starting by asking him to lift his feet with just a good old contact yield. Make sure you are in a safe position to do this of course. I would also try the front feet with this too if you can. Hi Judy, It can be very disappointing when an old behaviour returns like that but I can also hear lots of positive things in your message. Our horses habits/reactions will probably always be there, we just need to get to where they can cope better in those situations so that their reactions aren't as big or dangerous for us. The fact that you are no longer getting scared when your horse reacts and you have the skills to help your horse out in these moments is going to make a huge difference to Zoe and as you have found, the next time you do the same thing, she will be more prepared to think her way through it so a BIG WELL DONE to you! I would say that being in the 'scary' place alone was too much for your horse so her old reactions returned. 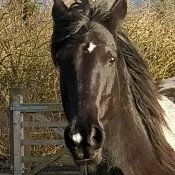 Keep ticking off those homework cards and moving forward in the programme to continue to build your horses confidence in all areas, and, think about doing more work in that area with the company of other horses to help Zoe get more confidence in the 'scary' place. Give her consistency with homework that she already knows and is familiar with to help her out then when you feel she is listening to you and nice and confident with this, you can start to work through this with her being by herself. Keep up the great work and remember that being a confident leader yourself, will help Zoe build her confidence and trust in you too. Please join us in Victoria for our Combined Worlds Biggest Play Day! Congratulations Tania Kabel-Pluck for completing her Level 1 Assignments with Connor!! 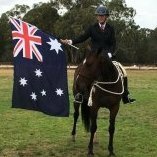 Tania is from Logan in QLD and Connor is the 4th horse she has taken through Level 1. Well done Tania! Does your horse get spooky when you take him somewhere new? Do you feel uncomfortable about using gadgets to control your horse? Do you want to be the best you can be for your horse? Life is not fun when your partnership with your horse is not consistent or there are ‘conditions’ to what you do together. Join us in this 4 day Quantum Weekend where you will learn why your horse can be inconsistent in his work and what steps you can take to help him become the brave, dependable horse that you have always wanted. You will also discover what it takes to help you to overcome your own survival instincts and learn to let go and really trust your horse. Learn why mainstream horse control doesn't make you safe and what you can focus on instead that will have you and your horse working together in a happy and safe partnership. This event is designed for MAXIMUM learning with small groups of no more than 5 people so you get the help you need with your horse. See the progress you make over the 4 days under Mel's tuition and feel confident to continue on at home with the new things you've learnt. If you would like to know more, contact Mel Click here to find out more QS Student Price – $500 (Due 8th Feb 2019) Full Price – $600 *Secure your position in this event with a non refundable deposit of $200 before the 11th Jan and receive a 5% discount on your ticket. Hey Tracy, the pawing thing can either be anxiety or as Shane mentioned boredom. Your other observations are saying he is ok, (is he sweating up on the float?) so keep an eye on it and keep ticking off your boxes. If it is anxiety from claustrophobia the programme will help you find other things to work on to help to continue to grow his confidence.